Life is Beautiful has turned Downtown Las Vegas into a breathtaking site to see. 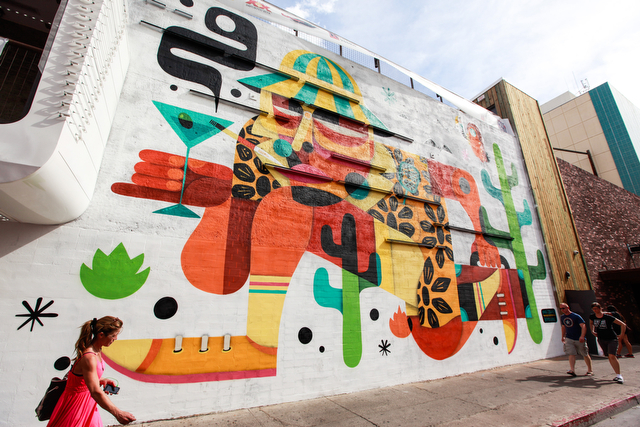 If you’re visiting Las Vegas, put DTLV on your agenda to check out Las Vegas street art. These incredible works of art come from different artists around the world. From D*Face to The Fat Jew to Banksy, DTLV is an urban museum. Today, we’ll shine the spotlight on one of Ruben Sanchez’ more popular murals of author, Hunter S. Thompson. Dubai resident Ruben Sanchez graced the DTLV area with one of Las Vegas’s most infamous legends, Hunter S Thompson. He was a talented writer and journalist with a very obvious and uncontrollable drug and alcohol problem—something he wasn’t shy about. The vibrantly colored image of Mr. Thompson has him holding a martini in what looks like a desert full of cacti, a bunch of bats and an odd-looking bird. Its bright colors and surreal imagery show just how quirky he is with just a touch of insanity. For those not familiar with the story of Fear and Loathing in Las Vegas, it’s a true story about the greatest (or worst) Las Vegas weekend bender in history. The story is pure chaos, as Mr. Thompson and company indulged in 24/7 drug and alcohol use. It’s a terrifying, hilarious, and hallucinogenic adventure. The mural is distorted and surreal, just as Hunter S. Thompson’s inebriated perception of everything. This Las Vegas street art perfectly exemplifies the darker aspect of the Las Vegas party scene and just how far we can take it. You can see all the famous DTLV murals and Las Vegas street art during a trip with Vegas Pub Crawler. To truly experience it, you must be there and see it for yourself right here in bat country. Book your bar hopping experience today!